A rare peek into the Border Police's 'Yamas' undercover commandos who arrest terror suspects disguised as Arabs. 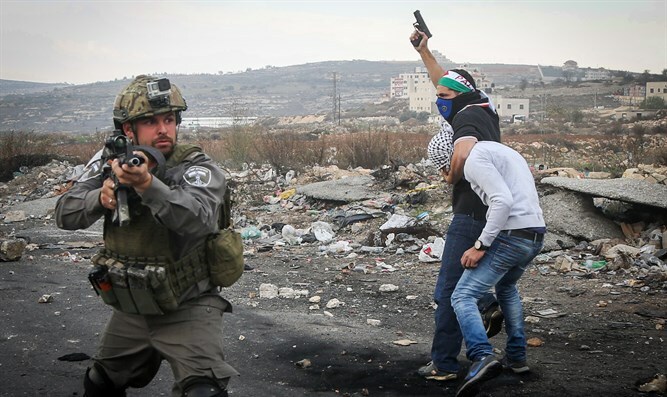 Undercover Border Police commandos arrested a 30-year-old Palestinian Arab that was suspected of terrorism in the village of Bidu, near Jerusalem. Earlier, the suspect had attempted to ram through the A-Zaim checkpoint north of Jerusalem. The soldiers carried out a procedure for apprehending a suspect, including shooting in the air, but the vehicle managed to escape. Later, undercover Border Police commandos arrested the suspect at his hometown of Bilu. "This is a very complicated operation that requires many actions, " said one of the operatives. "We are required to operate on tight timetables and we also know how to carry out arrests of this kind within a very short period of time after receiving a significant warning or intelligence." The soldiers, who are known as Mista'arvim, are required to pass a long and grueling training course are considered one of the best counterterrorism units in the world. Another unit of Mista'arvim also exists in Duvdevan, a unit in the IDF's Commando Brigade. In 2015, Yamas members were filmed executing a daring operation in the heart of Hevron in order to arrest a wounded terrorist that was recovering in Hevron's Alhali Hospital. Posing as an Arab family, including a woman preparing to give birth, undercover agents entered the hospital and took him into custody. The man's cousin was shot dead after resisting arrest during the operation.